The other day, I was assuming the 20 degrees high would call off my Cub lesson. I almost forgot about it until Jake reminded me an hour beforehand that I had it scheduled. I called the school and they said they were flying and they moved me to the “bigger” Cub and it was on skis. How could I turn down flying on skis?! I rushed to get ready and headed out to the airport. I was so excited to fly on skis! We went over to the Cub and it was pre-heating, though it wasn’t really warm. The engine was cool instead of cold. I learned how in the hangar the Cub sat on snow and sheet metal. We removed the sheet metal and set it on the snow. Within minutes, the skis were stuck to the snow and we had to shake it loose before pushing it out onto the snow. My CFI started out of the taxi, it required almost full power to start moving. When we hit the more icy area the power could be pulled back. He picked a deeper part of the snow on the runway to take off, told me how you had to feel the tailwheel lift out of the snow before you could even pull up and get it to fly. He also did the first landing. It was more of a soft field landing than we do on just the grass with wheels since during the last 10 feet. It’s a bit tricky to judge the distance with snow. It was my turn next and I first picked the more used part of the runway to get used to the skis. The next one I went into the deeper snow. 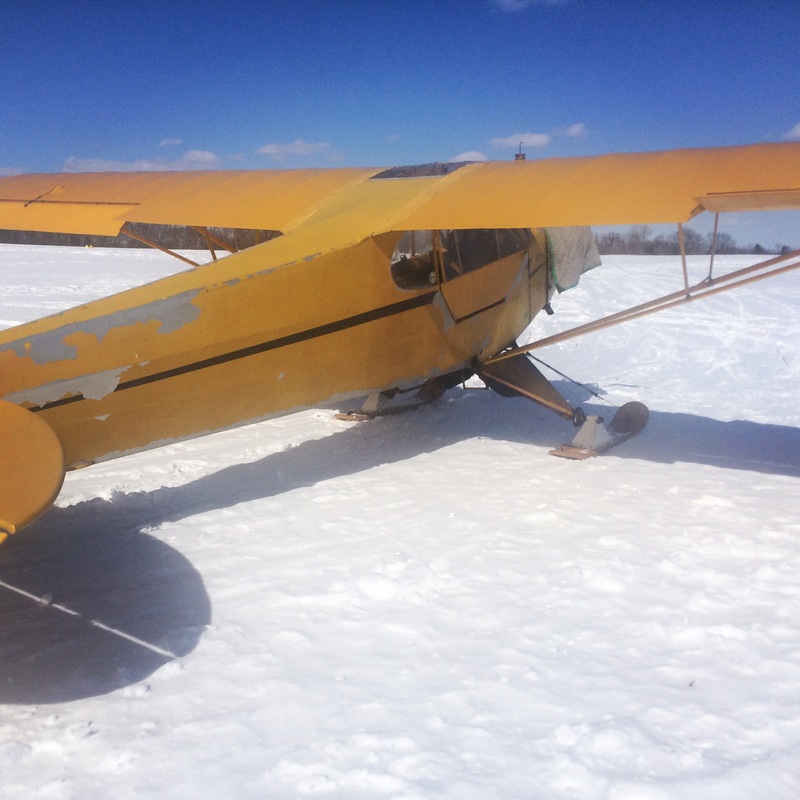 In the deeper snow, once we touched down it was pull the stick all the way back and dig the tailwheel in to stop since there are no brakes. My CFI asked if I wanted to head over to the gliderport to do a couple of landings since the snow was deeper over there. Heck yes! It was fun to land where we fly gliders. I imagined it’s practice for when I can fly the tow plane! My landings were overall a lot better from the last time. Only one landing bounced and my pattern work is getting back in the groove as well, I only had to slip on one landing as well. Maybe skis are a bit easier to handle, we’ll have to see on my next lesson. While flying in the Alaska bush sounds like a lot of fun, I’m not sure I liked being able to see my breath the entire time! Maybe you guys have stronger engines up there! The Cub’s only turns the air from cold to cool.